An incredible yarn from Cloughmills, County Antrim. The Main Street of Cloughmills, Northern Ireland, is lined with neat, two-story houses that flank a cluster of commerce—a local store, a butcher, a post office, even an Indian takeaway. This quiet village of just a couple thousand people, and five (five!) churches, has recently put itself on the map. But not just any old map. These establishments, and many of the town’s other buildings, have been enshrined in wool by the village’s ladies’ crochet group, and publicly displayed in the town’s Memorial Orange Hall. Local resident May Aitcheson started the club six years ago. Now, it has 30-odd members, most of whom are retired. “I didn’t realize it would keep going the way it’s done,” she told the BBC. In May of last year the members got together to begin work on the mammoth model of their village. They headed out first with cameras, and then began to craft the houses and other buildings, with six women in particular doing much of the work. They even created a few sites that no longer exist, including the old shirt factory where many of the members once worked. They finished the project in September. Model cars are interspersed throughout the village. Aitcheson had been inspired by a small model village she saw in Cushendall, a similarly sized place some 15 miles away, “but ours snowballed,” she said. It’s now too large to fit out of the doors of the hall, and will remain on display for as long as there are visitors to come and see it. In the meantime, Jim Witten from Cloughmills Community Action Team says, the project has brought the village a lot of attention, with community groups from across the country inspired by this marvel in wool, which has helped raise money for Macmillan Nurses’ cancer support. The group continues to get together weekly to “get the latest gossip,” member Margaret Murphy said, though they’re still waiting on their next big idea. 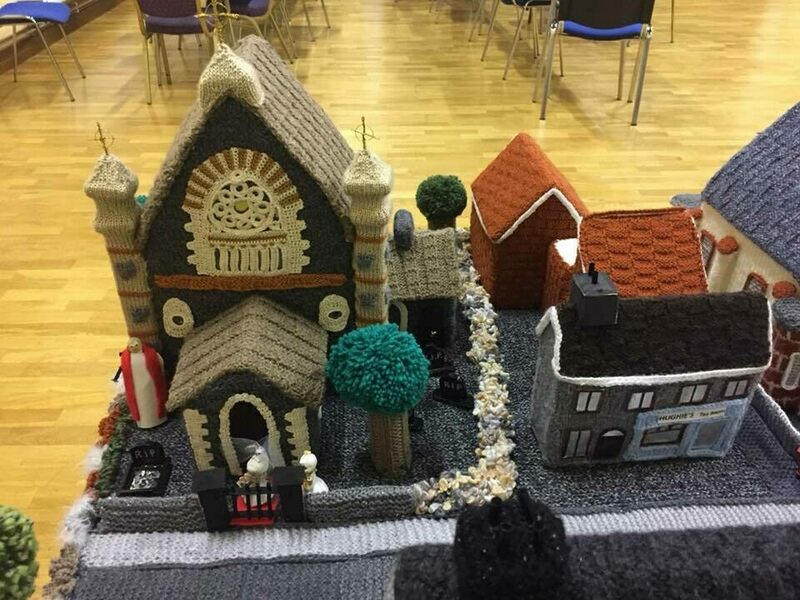 “Maybe a model of Belfast, but we’d need lots of helpers for that one.” Atlas Obscura has images of their needlework. The village’s houses and tennis hall alike have been rendered in wool. Even scarecrows have been replicated. Woolen people complete the idyllic village scene. The building on the right is the town’s Orange Hall, in which the model village is displayed. Tiny vegetables grow in the model village’s gardens. A bridge runs over a local stream, made to glisten with rocks and fabric. Using needles and yarn, a medical student is working his way through the human body. Thanks to a visualization tool being used to develop stem cell therapies.